The word Maam is derived from the Gaelic word Mam meaning mountain pass. 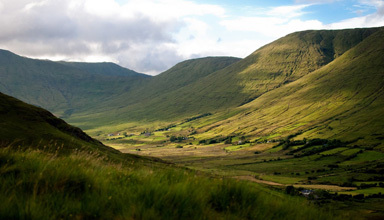 The Maam Valley, which extends from Maam Bridge north-westwards to Leenane, lies at the centre of a deeply dissected mountainous region. It is flanked on the south-west by the steep rocky ridge of the Maum Turk Mountains which rise to well over 2,000 feet at several points. To the north-east the valley is bounded by a group of lower, less hostile hills known collectively as Joyce's Country. The valley floor is relatively flat and covered in most parts with blanket peat or thin podzolic soils overlying glacial deposits. The valley is drained by two river systems, the major one being that of Joyce's, Bealnabrack and Failmore Rivers which flow into Lough Corrib east of Maam Bridge. A smaller unnamed river drains the northern end of the valley, flowing from the watershed at Culliagh Beg down to Killary Harbour at Leenane.